COLORADO SPRINGS, Colo. – All of the preparations for Santa’s journey are in place, according to the NORAD Santa Tracker Web site. 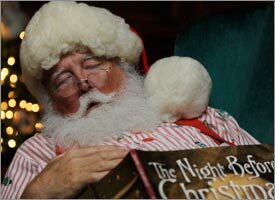 In addition, Santa’s elves have been busier than usual this year preparing for Santa’s launch tonight. You can visit the NORAD Web site to receive updates directly from the North Pole. NORAD officials say they use four high-tech systems to track Santa – radar, satellites, Santa Cams and fighter jets. Tracking Santa starts with the NORAD radar system called the North Warning System. This powerful radar system consists of 47 installations strung across the northern border of North America. On Christmas Eve, NORAD officials say they monitor the radar systems continuously for indications that Santa Claus has left the North Pole. NORAD officials say that the moment the radar indicates Santa has lifted off, they use their second detection system. Satellites positioned in geo-synchronous orbit at 22,300 miles from the Earth’s surface are equipped with infrared sensors, which enable them to detect heat. Amazingly, they say that Rudolph’s bright red nose gives off an infrared signature, which allows their satellites to detect Rudolph and Santa. NORAD officials say that the third tracking system is the Santa Cam network. They began using it in 1998, which is the year they put their Santa Tracking program on the internet. Santa Cams are ultra-cool, high-tech, high-speed digital cameras that are pre-positioned at many locations around the world. NORAD only uses these cameras once a year. The cameras capture images and videos of Santa and his reindeer as they make their journey around the world. NORAD officials say that the fourth system is made up of fighter jets. Canadian NORAD fighter pilots flying the CF-18 fighter jets intercept and welcome Santa to North America. In the United States, American NORAD fighter pilots in either the F-15, F-16 or the F-22 get the thrill of flying alongside Santa and his famous reindeer: Dasher, Dancer, Prancer, Vixen, Comet, Cupid, Donner, Blitzen and, of course, Rudolph.